The past few months had been an awakening spiritual journey for me. First a book and then the meditation retreat. My spiritual quest started when I was 18 years old. That’s when I attended the 7-day awareness program which thought me about positive thinking, the power of unconditional love, and guided meditation. Ever since that, I’ve practiced meditation on and off, attended courses on self-awareness, read books on spirituality and meditation, and tried different meditation techniques. I’ve always been searching for the right answer. And I finally found it from Eckhart Tolle’s The Power of Now. This book contains the ultimate truth – the simple truth; something that my soul resonated right away. I first read his book The New Earth sometime last year. However, that book didn’t have the same transformative effect on me as the The Power of Now had. Probably I wasn’t ready to accept the truth then. This year has been a tough journey for me emotionally. I felt depressed on some days; and then I’ll pick myself up by doing whatever I enjoy doing; and then I’d feel empty again; and the cycle repeated. The fact that I’d left my job and felt lonely was aggravated by my pregnancy hormones. I felt lost and empty. I didn’t realize what I was doing to myself and to my husband. Some days I will lie on bed the whole day not having mood to do anything; feeling sorry for myself. I found that it became increasingly difficult to control my negative thoughts – it was spiraling beyond my control; and I was constantly battling against my thoughts – it was mentally and emotionally draining. I felt that I’ve fallen into a dungeon and there’s no one to help me to get out. My husband just didn’t know how to help me. I blamed my husband for the way I felt – I didn’t realize that my misery was contagious – and he’s only human. There’s limit to how much he could take – and I continued blaming him for not understanding my feelings. It was at this point in time during my emotional downturn that I picked up The Power of Now which has been sitting on the bookshelf for quite some time. Every word, every message in the book pierced straight into my heart – my heart knew that the message is true. Rather than playing the blaming game, I started embracing the way I felt; and that felt so liberating. I could immediately sense the deep-seated peace and joy within me – it’s truly amazing. I learned to still my mind and be the silent observer of my thoughts and emotions. It’s so powerful I started noticing change deep within me; I started understanding my actions and emotions; I started embracing everything around and within me with love. It’s truly liberating, I suddenly felt so alive. And this wasn’t the same kind of short-lived euphoria I felt when I read other self-help books. 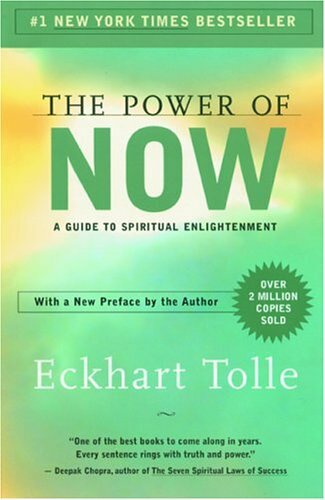 Reading the Power of Now felt like going straight to the core of my Being; my being became instantaneously connected with the author’s message; the message rang so true to my soul. Probably it’s because I was in intense emotional pain; the suffering catapulted me to a new level of consciousness upon reading this book. Rather than dwelling in pain, I became aware/conscious of my pain and began to embrace it unconditionally. And I felt FREE. It also helped me to understand my relationship with my husband better. However, as Eckhart Tolle pointed out, not all readers might feel the same transformative effects after reading the book. Sometimes, the message from the book will act as the seed of enlightenment/consciousness sometime later in a person’s life. After reading the book, I realized that all the spiritual teachers in my life have pointed to the same message (only the way of imparting the message was different) – and I begin to appreciate the unison of message in all the religions and spiritual practices in the world – the message/lesson imparted points to the SAME SOURCE. I accept that some days are good and there are some not-so-good days. Rather than brooding over the not-so-good days, I’ve learnt to accept it as it is and it feels liberating. As with all conditioned thought processes and mental habits, change is about taking one step at a time. Whenever I find myself dwelling in the past or anxious about the future, I remind myself to come back to the present moment; the here and now – that’s the secret of being. This entry was posted in BOOKS AND READINGS, RANDOM THOUGHTS AND MUSINGS, SPIRITUALITY. Bookmark the permalink.